To be successful in the anti-doping movement, it is imperative that we understand all sides of the issue, including the perspectives of athletes, sports organizations, scientists, and yes – even the fans. This is why we recently conducted a unique survey of the American public on the topic of doping in sports, particularly in the Olympics. Realizing where the public stands on this issue is important for athletes and sports organizations as they consider how to reduce doping and improve the culture of sport. This is probably because while watching the Olympics, two-thirds of adults admit they sometimes suspect the athletes they are cheering on might be using PEDs. 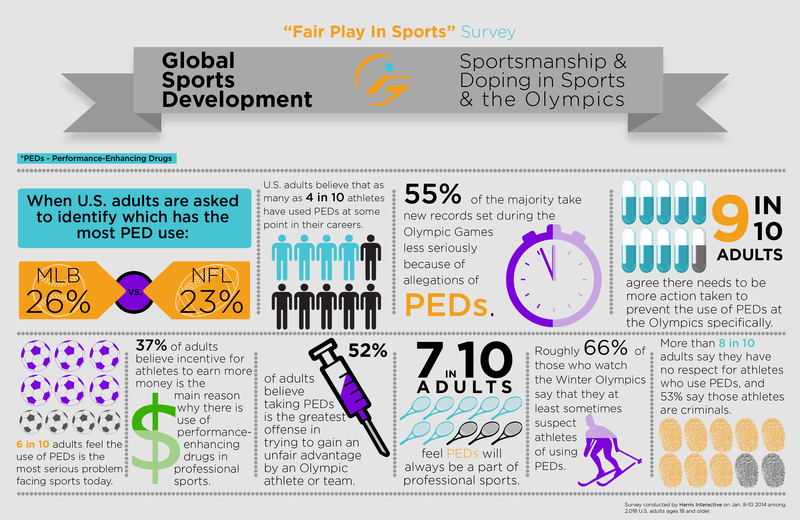 Eighty-eight percent of adults agree that more action needs to be taken to prevent the use of PEDs at the Olympics and in all professional sports (89%) today. How can we deter athletes from doping? Well, 74% of adults want more frequent drug testing, and 60% support an “immediate one-year suspension of all athletes caught doping.” More extreme actions are also supported, such as suing athletes for breach of contract (60%) and even jailing convicted athletes (25%). Survey Infographic. Click to enlarge. Despite the general consensus that PEDs detract from sport and the public wanting a more thorough crackdown on the problem, 72% of the public seems to agree that “the use of PEDs will always be a part of professional sports.” We’ve heard scientists and athletes voice this opinion as well, but there is a contingent of retired and active athletes, hard-working scientists and physicians, and at least 28% of the public who believe it is possible to eliminate the use of PEDs from sport. The Foundation for Global Sports Development is working with those who seek to clean up sport, and we invite you to join our endeavor. Click to sign up for “The Playbook,” our weekly newsletter. As of today we have just 17 days left before the Opening Ceremonies for the 2014 Winter Olympics in Sochi. The opening ceremony for the Olympic Games is always an event to behold, featuring outstanding performances, music, the (required) release of the pigeons, historical elements, and of course the athlete parade. 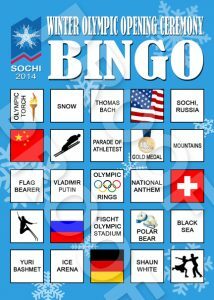 Just because you can’t attend the ceremony in person doesn’t mean you can’t enjoy it with as much fanfare as those in Sochi! 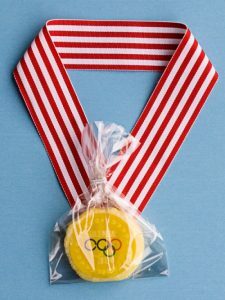 Start the Winter Olympic season right with these ideas for a great Olympic themed party. You still have plenty of time to have people reserve this night on their calendar! Whether you’re planning a sleepover for your kids or an adults-only viewing party, two weeks should be plenty of time (besides, surely EVERYONE has reserved this night for the occasion, right?). 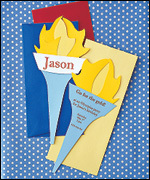 If you want to send invitations through the regular mail, here are a few cute invitation ideas. 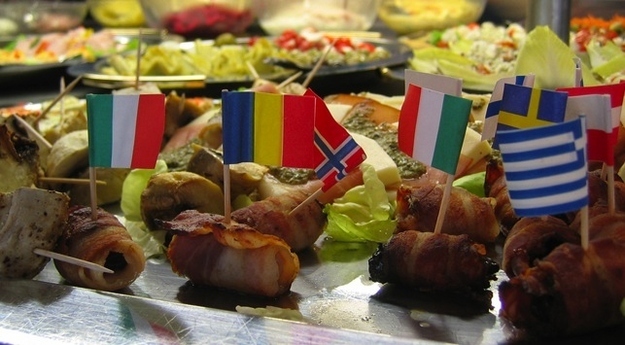 You can also find printable flags of countries here, perhaps to make a flag banner. If you need to entertain small children during the games, here are some printable coloring sheets. 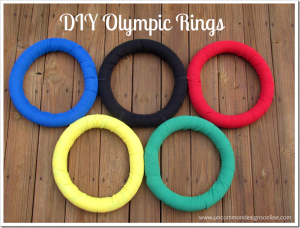 You can also help them create an Olympic Ring paper chain. 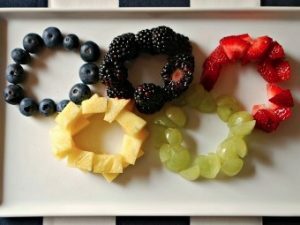 Find more ideas on our “Olympic Fun” Pinterest board. Concussion is one of the most serious risks to young athletes. Whether the athlete plays football, hockey, soccer, baseball, or any number of other sports, education and prevention efforts are crucial in reducing the risk for concussion. • “Each year, U.S. emergency departments (EDs) treat an estimated 173,285 sports- and recreation-related TBIs, including concussions, among children and adolescents, from birth to 19 years. • During the last decade, ED visits for sports- and recreation-related TBIs, including concussions, among children and adolescents increased by 60%. • Overall, the activities associated with the greatest number of TBI-related ED visits included bicycling, football, playground activities, basketball, and soccer. Sometimes an athlete could start feeling certain symptoms without being aware that they may be in danger of a concussion.Without knowing what to look for, they could keep playing, putting themselves at risk for greater injury. Both athletes and coaches need to know what to look for – especially if the athlete has had some trauma to the head. The Centers for Disease Control has resources available for coaches, athletes, and parents regarding their program Heads Up: Concussion in High School Sports. These resources include downloadable materials covering what to look for and action plans in the event a concussion occurs. Materials can be downloaded at http://www.cdc.gov/concussion/HeadsUp/high_school.html. A study was conducted by the Journal of School Health to determine the effectiveness of these CDC materials, and 340 coaches responded. After reviewing these materials, the majority of coaches increased their emphasis on concussion prevention and awareness, with 68% of the coaches educating others after receiving these materials. One issue surrounding concussion in sports is the athlete and coach’s desire to go back on the field before they’re ready. With a heightened awareness of concussion symptoms, both athletes and coaches can work at recognizing when the right time to return to the field might be. Each state (except Mississippi) has adopted a Return to Play law, which aims at increasing awareness around concussions and their symptoms and protecting young athletes from more severe injuries. States individual Return to Play laws can be accessed here. Professional sports have started taking head injuries more seriously. The NFL has altered its rules in the past few years to try to prevent serious brain injury. In late 2013, after many catchers sat out weeks of the season with concussions, Major League Baseball announced that collisions at the plate would be outlawed. It’s unknown how this rule will affect actual play, but the intent can have positive implications throughout sports. Injuries happen, but brain injuries should not. Centers for Disease Control and Prevention. (2011) Concussion in Sports: How Can I Recognize a Possible Concussion? http://www.cdc.gov/concussion/sports/recognize.html. Centers for Disease Control and Prevention. (2011) Concussion in Sports and Play: Get the Facts. http://www.cdc.gov/concussion/sports/facts.html. Frollo, Joe. (2013). See Where Your State Stands on Concussion Law. USA Football. http://usafootball.com/news/featured-articles/see-where-your-state-stands-concussion-law. Kluger, J. (2011). Headbanger Nation. Time, 177(4), 42-51. As of today, we are officially one month away from the first events for the 2014 Winter Olympic Games in Sochi. Just a few short weeks before we get to experience the exhilaration of icy and snowy competition. 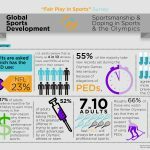 This year The Foundation for Global Sports Development will offer an Olympic Resource Station for those of you watching the games at home. Sure, it’s not easy skiing down a hill full of moguls, but it’s also hard work keeping on top of all the latest Olympic news! 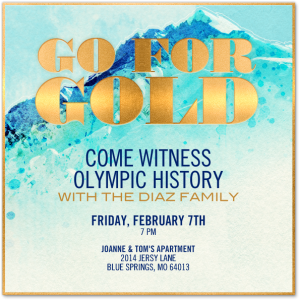 With the Olympic Resource Station, you can be in the know about athletes, fun ideas for kids, event results, Olympic highlights, and even historical information about the events. Bookmark our website now, and stay tuned for the unveiling! Here we find ourselves again, welcoming a new year and all it will bring into our lives. About 45% of Americans take this opportunity to set the tone for the rest of the year by making New Year’s resolutions; whereas, 38% of Americans never set specific goals for the New Year. It’s easy to see why so many people opt out of making resolutions, because only 8% of people actually achieve their goal. As with most ventures, solid preparation in setting goals and resolutions will help people follow through on their goals. This time presents an excellent opportunity to teach young athletes about goal setting. The process of setting goals guides athletes to understand their current level of skill and achievement and their ability to progress. 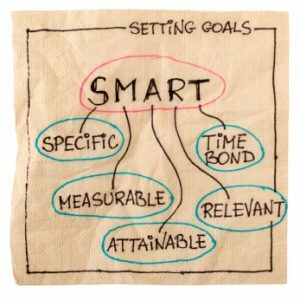 Establishing goals may seem simple, but to do so effectively requires an understanding of the types of goals, especially related to athletics, and the process to set, monitor, and accomplish an objective. Outcome Goals are related to the big picture of athletics and competition, such as winning a game or making it onto a particular team. It is important to realize that oftentimes, athletes have very little control over the external factors which could affect their outcome goal. This type of goal is important as it can serve as motivation for an athlete as they may encounter obstacles in accomplishing the performance and process goals, which we describe below. An outcome goal is the “prize” in the saying, “eyes on the prize.” An example scenario for this would be for a young woman who decides she wants to be on her high school basketball team. Performance goals are excellent benchmarks for mapping one’s progress as they strive to meet their outcome goal. Let’s follow the illustration of the young basketball player who wants to be on her high school’s team. Tryouts involve a variety of challenges, such as running a mile in under 14 minutes or being able to make a certain percentage of free throws. The athlete would establish these measurable targets as her performance goals. Process goals relate to the everyday aspects of meeting the larger outcome goals, and they are the “how” in accomplishing performance goals. Unlike outcome goals, athletes are typically able to have complete control as they strive to accomplish process goals. In the case of the young basketball player, her stance when on the free throw line or her form when running, can impact the performance goals that will allow her to make it on the team. This is where practice, determination, and sometimes frustration come in. An athlete may feel discouraged if they have difficulties making progress with these goals, and that is why it is always important to help them realize these are steps in a bigger picture. Experts and researchers have identified an effective process in goal setting which can lead to more success. They’ve even come up with a clever acronym to help us through the process: SMART. Goals should be specific, measurable, attainable, relevant, and time specific. Keeping these guidelines in mind, there are also steps one should take in identifying each goal. Write it Down – Try expressing your goal in present tense, for example, “I run two miles in under 14 minutes.” Doing so allows you to shift your reality and actualize your goal. Also, focus on positive and affirmative language, rather than negative tones. Instead of saying what you won’t do (“I won’t stay up late.”), write down what you will do (“I will be in bed by 9 pm each night.”). Determine Measurement for Goal – In order to track success, it is imperative to define what “success” means. Whether you want to eat more nutritious meals before games and practices or if your goal is to be prepared for practice each day, there is a way to measure it. For example, if your goal is to eat better, you can track your nutrition by the numbers. If you want to be prepared for practice each day, set your measurement to be how early you arrive to practice or how long it takes you to get ready for practice. Set a Time Limit – Sure, if your goal is to make the US Olympic swimming team, then your timeframe could be many years. But for EACH goal (outcome, performance, and process) set a deadline to meet it. Not only does this keep you on track, but it creates a challenge AND sense of accomplishment as you meet goals in succession. Identify Obstacles – For the athlete whose performance goal is to be prepared for daily practice, what kinds of hindrances might he encounter? After-school club meetings, overwhelming school projects, illness, etc. In a perfect world our schedules would run without interruption. But reality requires us to recognize situations which could possibly get in the way of us reaching our daily goals. Overcome Obstacles – Okay, so now you know that your lack of knowledge about the proper form during running is a bit of a hindrance to you shaving off some time from your two miles. How will you get around this? Several options await you, such as consulting a coach or professional to help you, researching on the internet, video recording yourself run to examine your current form, etc. With each hurdle you recognize, create a plan for leaping over it and moving forward. Review Goals – Now that you’ve written everything down, read over it. Do the goals align and make sense? Is there anything missing from your list of obstacles? Monitor Progress – Track your measurable objectives and evaluate your progress. If you are trying to reduce your two mile run time by 3 minutes, write down your time for each run. Figure out a reward system if that helps, too. Okay, you may be feeling overwhelmed at this point. Identifying the types of goals, working through all of the steps, and keeping other tips in mind – it is a lot. But it’s worth it. Coaches, parents, teachers, and teammates can be helpful in organizing your plan. Also, try using a goal-setting worksheet to visualize your goal. Print multiple copies and keep them in prominent places, such as your school notebook, bathroom mirror, or locker. Give it a try, and see if your success is different when you map your goals out in a careful fashion, and above all: Keep your eyes on the prize!